﻿Heck's patented line of Beveling machines provide a more effective method of beveling over slow grinding and torch cutting. ﻿﻿Rigid mount, quick change angle rollers eliminates complicated angle changes. Pro 6-C, Pro12-C, Pro-12, Pro-20 are supplied with cylindrical bottom roller for performing 30° chamfers, By fitting tapered rollers, available on request, the angles can vary from 20° to 45°. 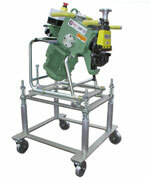 A wide range of cutters are available to process material of different hardness, from aluminum to stainless steel. Models 12-G and 21-G are Variable angle. 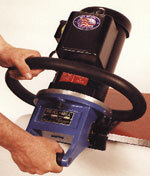 Machines simply rotate a hand wheel for the need Bevel-angle.